Caps could spur "land rush" for Mercedes stores, adviser says. 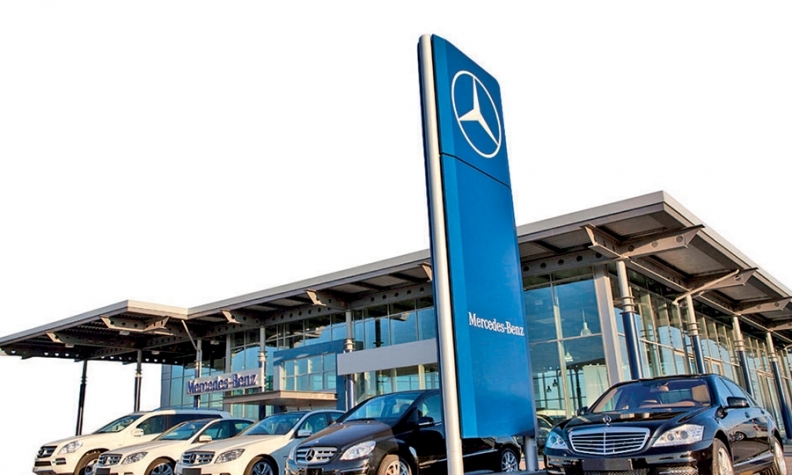 KNOXVILLE, Tenn. -- Mercedes-Benz USA is talking to its retailers about putting a cap on the number of stores any single dealership group will be allowed to own. But it doesn't plan a uniform cap, applied equally to all groups, which makes some dealership groups wary. Mercedes-Benz USA chief Steve Cannon says he is looking out for the future of the brand and wants to protect it from having too much concentration with any single group, especially as dealership consolidation activity picks up and more outside investors look to get into auto retailing. Cannon confirmed the discussions with dealers to Automotive News in an interview at a press event here last week. "If suddenly one entity comes in and buys up all the dealerships, then we don't have competition, and we're looking to make sure that we keep a balanced portfolio with our dealer network," Cannon said. "We've got a nice variety. We like that variety, and we'd be nervous about overconcentration against any single group." Mercedes has governed the brand's exposure to big retailers through individual framework agreements that have limited expansion to an undisclosed percentage of sales. Cannon says he's now looking to make those framework agreements more precise by tying them to a specific number of dealerships. Each group would have its own number based in part on how many Mercedes stores it has today. Having different caps for dealership groups that compete with one another is a concerning prospect for some retailers. Jeff Dyke, executive vice president of operations at Sonic Automotive Inc., the country's fifth-largest dealership group, said he needs to understand more about what Mercedes is trying to accomplish before he would agree to anything. "We can't be put in a position where we're not competitive as to the number of stores versus what another dealer group might have," Dyke said. "We're not going to sit back and let our competition get an upper hand on us unless they come to us with a very, very good explanation. That is contradictive to the benefit of our shareholders." Dyke noted that Sonic has had a great relationship with Mercedes under Cannon's leadership. The retailer has seven Mercedes stores and soon will open an eighth, in McKinney, Texas. Cannon: Wants to protect the brand. Pete DeLongchamps, vice president of financial services and manufacturer relations at Group 1 Automotive Inc., the nation's third-largest dealership group, said he hasn't seen a proposed number, but he's not concerned. Group 1 has eight Mercedes stores. From "what I have heard, it sounds very reasonable," DeLongchamps said. "With Steve in charge, it's a very fair company and very dealer friendly." The country's largest new-car retailer, AutoNation Inc., is also the largest Mercedes retailer. It has 22 stores with another slated to open in Atlanta soon. AutoNation CEO Mike Jackson used to have Cannon's job as head of Mercedes-Benz USA. AutoNation executives declined to talk in detail about the discussions. "We have a great partnership with all our OEM partners, and the framework agreements in place are confidential," AutoNation Chief Marketing Officer Marc Cannon said. "Mercedes is a great partner to continue to grow with." Steve Cannon acknowledged he's received some pushback from dealers unhappy with the idea of having different limits for the various groups. "Look, we've got to look out for the long-term best interest of Mercedes-Benz and the Mercedes-Benz franchise. That's my job," he said. "It's almost like a portfolio manager who's exposed to any one stock. Suddenly, if a large group decides, 'We don't agree with your strategy. We're going this way,' we've got a big conflict that impacts a large number of stores." New ownership caps could have a spillover effect on the hot acquisition market for Mercedes stores, said Alan Haig, president of Haig Partners, a buy-sell advisory firm in Fort Lauderdale, Fla. The discussions could trigger a "land rush" to buy stores now while retailers have more free rein. But after caps are in place -- especially if the big groups are near their limit -- the market for Mercedes stores could be chilled as potential buyers "wait for the very best store to come along," Haig said. "There are some valid reasons why manufacturers are concerned about overconcentration," he said. "But if they limit it too much, then you wipe away the biggest buyers because they're beholden to a cap." Steve Cannon described the discussions as "early dialogue." He declined to predict when the proposed constraints would be final, other than to say "as soon as I can get our dealers comfortable that we're not trying to pull one over on them, that we're just making reasonable decisions that are all about the health of the brand."